One might at first misinterpret the series of red flags hanging along the string across the room. They may be taken for paper flags put up there, to celebrate a feast but alas it is not so. 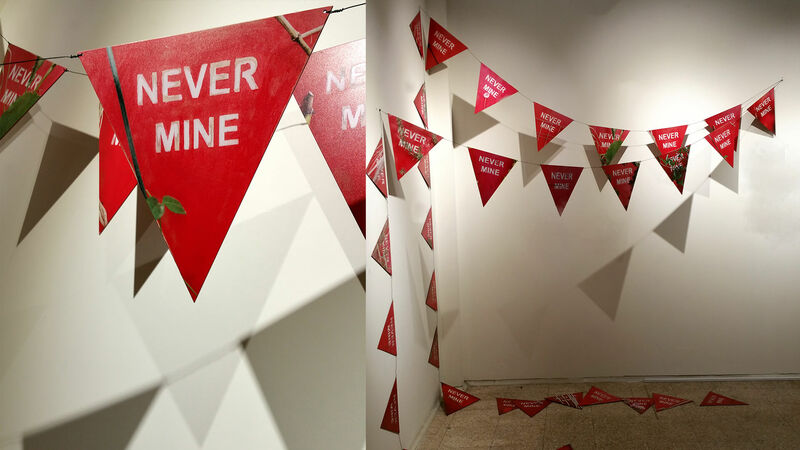 Antoniou’s red triangular signs stand there as witnesses to a more sinister event; these are actually minefield alert signals documented by the artist in different parts of the island of the Cyprus after the 1974 war (elements of the area/geography are obvious or implied in the images). 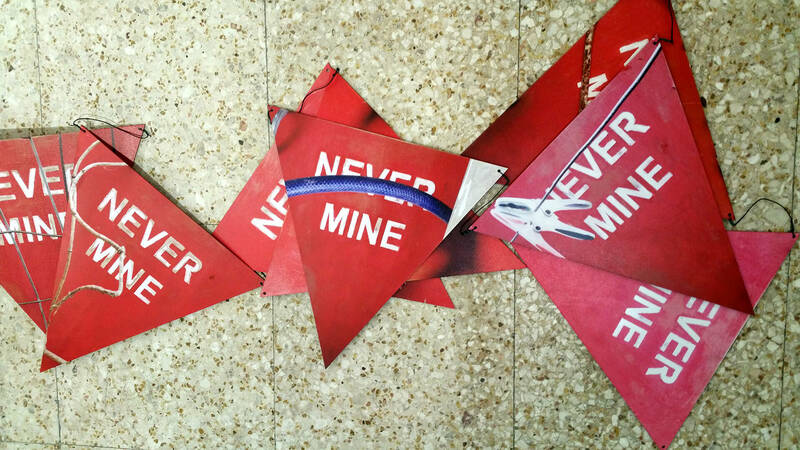 Images of these minefield signals gathered by the artist printed upon a metal triangular surface. To the inscription that initially read Mine, the word Never is being added. 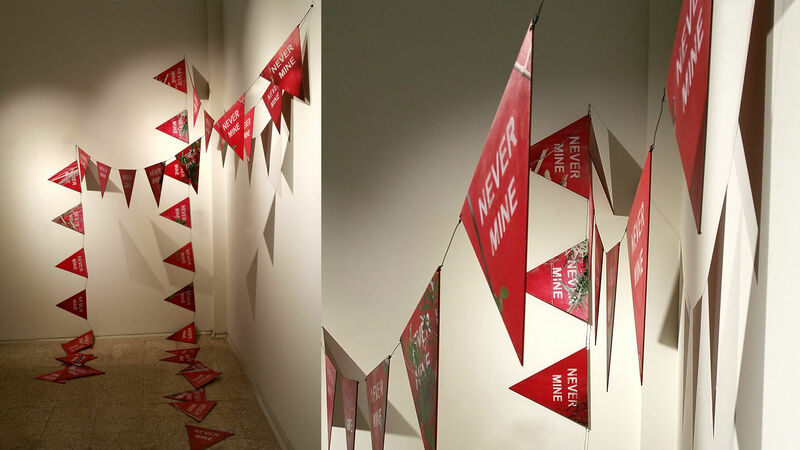 And what initially seams as string of red paper party flags set out to mark a joyous event becomes a relentless symbol of life’s transient nature denoting the reversibility of Place identification and the ephemeral nature of man’s existence upon the ground. 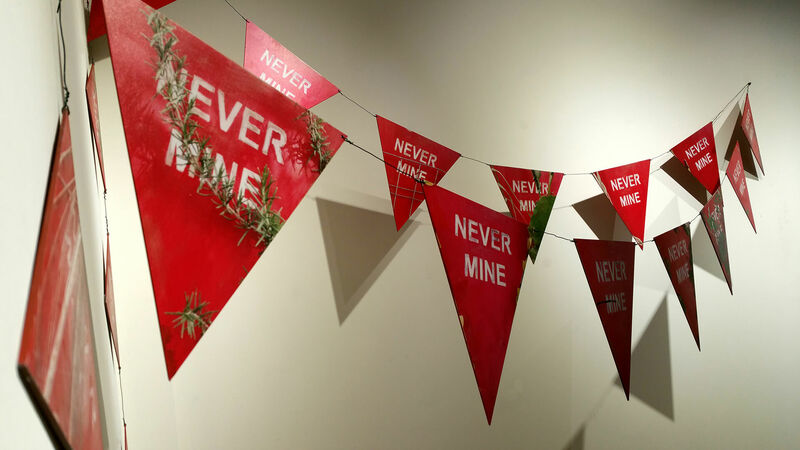 [Exhibited next to Never Mine (Video)] the two works are distant in time, one referring to mining activity in the 1920’ s and the other on the existence of mines in the post- 1974 era, both events that deeply determined collective Place Identification with the landscape of the island of Cyprus. 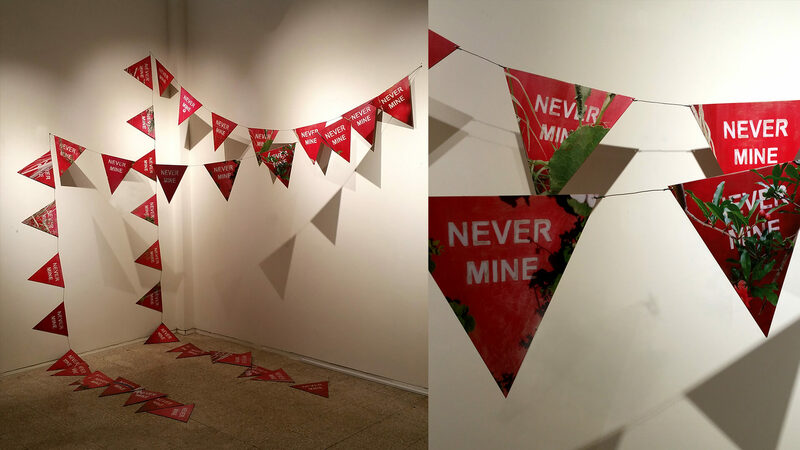 But Klitsa Antoniou succeeds to gap this discontinuity in time in what Deleuze would refer to as Active Synthesis creating a contemporary twofold constructed upon memory tokens which defy distance in time proclaiming their validity of relation under the title theme, Never Mine. There is a certain rhythm running through Klitsa Antoniou’ s work; a repetitive (imaginary) sound runs through the two works. In the metal sound the minefield flags would make banging against the wind, to the repetitive sound of the sea washing out to the shore and the overwhelming thumbing of the miners’ shovels underground.